To be considered a a historic property, the property must be a Contributing, Master List or Mills Act property. The Mills Act is a California State law allowing cities to enter into contracts with the owners of designated historic properties who agree to preserve, maintain and improve their property, in exchange for property tax savings. To be eligible for the Mills Act, properties must be on the City's Master list of historically significant properties. 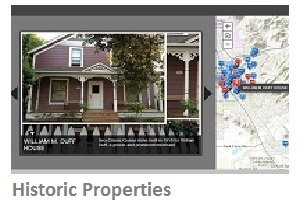 Identify and appreciate our historic properties while you navigate the City by accessing the storyboard map from your Smartphone or tablet. Visit the GIS Smartphone Apps webpage to learn more about this feature and browse other City maps accessible from your Smartphone or tablet.